Once a month Ettieboo descends upon the Aeronaut with her band; she’s sassy, she’s sharp, she takes no prisoners but shows no mercy… and she’s blue. 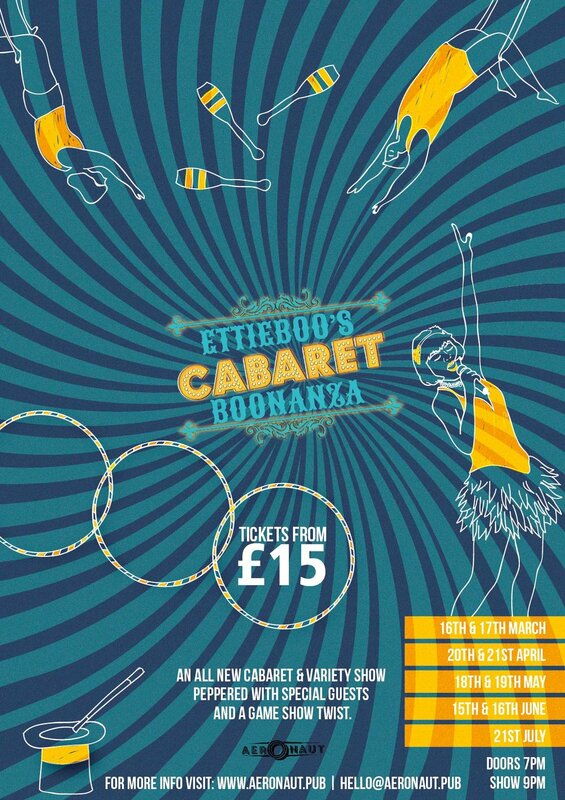 Every Friday and Saturday, Ettieboo, her band, and cabaret/variety guests will entertain, impress, and involve the the audience in her talkshow-esque world for approximately 90 minutes. With a new setlist every month, centred, if appropriate, on a theme Ettieboo will sing to, speak to, and even interview her audience. The show will be peppered with special guests from the variety and cabaret world, demonstrating their own skills, and improvising with the band. There will be opportunities for the audience to join in, gameshow style, and win a bottle of champagne, or tickets to another show, or simply a bag of nuts. Such is the nature of gameshow improvisation.